If you are looking for economical and reliable transportation while living in or visiting Dubrovnik, then city bus transportation is the right solution. Public transport in Dubrovnik is carried out by Libertas. There are 10 bus lines in Dubrovnik, connecting all parts of the city with the city center. The main bus stop is located in the area of ​​Pile, which is at the entrance to the old town walls. Bus number 6 runs from the Pile station every 15 minutes towards to Lapad and Babin Kuk, where you can find the largest number of hotels and private accommodation. 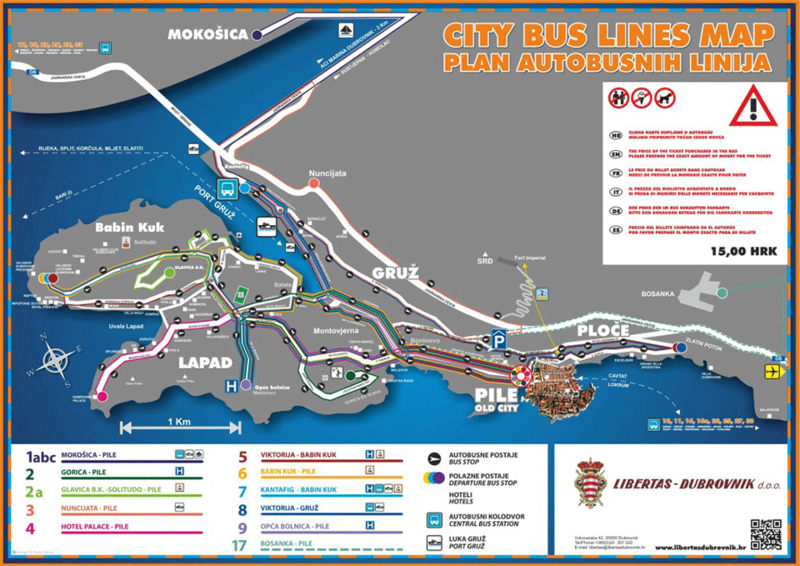 You can check the map of all city buses in Dubrovnik here, and the schedule for all city buses here. 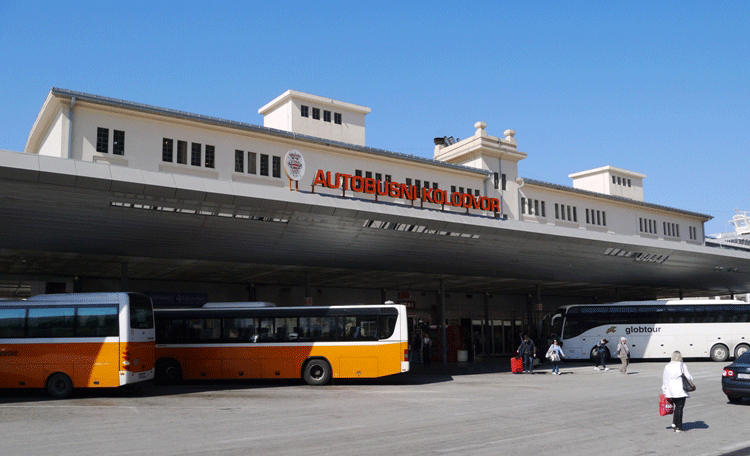 Bus tickets for public city transport in Dubrovnik can be purchased directly from the drivers or Libertas kiosks located in the area of ​​Pile, Lapad, Gruž or Mokošica. If the ticket is purchased on the bus, the price will be 15 kn. However, if the ticket is purchased in re-sale from a trafika or Libertas kiosk, the price of the ticket is 12 kn. Keep in mind, you may only purchase a ticket on the bus in cash. The ticket is valid for 59 minutes after the first stamping and can be used in all directions. So if you need to go to Babin Kuk from the center of the city and back, you can do it with the same ticket provided that the journey takes less than 59 minutes. This only applies to Dubrovnik public transport. Most cities only allow you to use a bus ticket in one direction. In Dubrovnik, you may purchase one-day tickets valid for 24 hours from the first stamping with no restrictions on the number of trips. One day ticket price is 30 kn and can be purchased at the aforementioned Libertas offices. Children under the age of 6 years old accompanied by an adult do not pay for public transport. You need to enter the front door of the bus and show a valid ticket to the driver, which you will need to time stamp in the ticket stamping device, which is most commonly located immediately behind the driver. You should also know that there are frequent ticket checks. You are required to show your stamped ticket or bus pass at the request of the official public transport controller. If you do not have a ticket or if you have not properly stamped it then you will be charged a penalty of 100 kn on the spot. 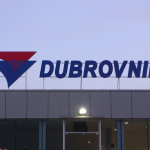 Public transport in Dubrovnik runs from 05:00 to 24:00. The Libertas Company also has a toll-free number 0800 1910 where you can refer all inquiries or complaints related to public transport. 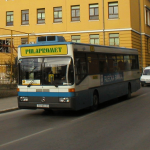 Public transport is also organized for suburbs of Dubrovnik. The most popular suburban line of public transport is the one to Cavtat. Bus number 10 runs every 45 minutes to an hour towards Cavtat. The starting point from Dubrovnik is in Gruž. The ride to Cavtat takes 25 minutes and a one-way ticket costs 25 kn. Dubrovnik is also connected by suburban lines to Slano, Ston, Molunat, Plat, Srebreno. You can see the timetable for suburban lines here, and you can see the map of city transport in Dubrovnik here.